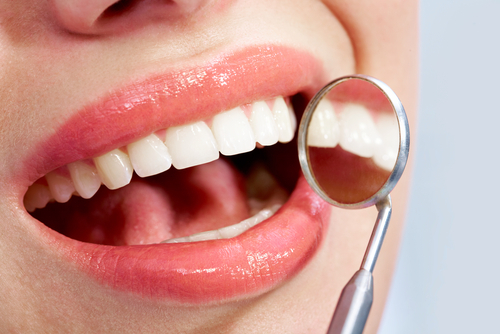 White fillings restore the natural color and appearance of the teeth. White fillings are made of composite resin or porcelain (inlays or onlays) and restore the natural color and appearance of the teeth. The use of composite resin as “white filling” is a quick and easy procedure and can be completed in one appointment. It is placed in the cavity of the tooth, in thin layers. Each layer becomes hard with the help of a special light.The filling is bonded to the tooth structure.This sealing prevents tooth decay better than amalgan fillings. Composite resin has the same color as a natural tooth. The disadvantages of composites include higher cost, moderate wear resistance and the success of the procedure depends on the condition of the mouth (technique sensitive). Composites are suitable for small to medium size cavities. Large cavities in the back teeth are more suited to a tooth-colored inlay or onlay. Porcelain inlays and onlays are also bonded to the teeth.They strengthen and support the teeth and are more fracture and wear resistant. They are produced in the lab, provide greater strength and durability and last for a long time. The disadvantages of porcelain fillings include the higher cost in comparison to other alternatives(composite or amalgan) and in most cases more than one appointment is needed. Should existing amalgam fillings be replaced? In the past, dental amalgam (silver fillings) was the most common material used to fill cavities. Over the years concerns have been raised aboyt the use of amalgam because it contains mercury. Several studies concluded that the amount of mercury released from amalgam in the mouth is very low and less than the amount that most people are exposed to in their daily enviroment or in the food they eat. People who have high exposure to mercury ( through their jobs or people who eat large amounts of seafood) may want to avoid amalgam. The main reason for replacement of amalgam fillings is aesthetic.